Customer satisfaction is their goal. If you are not completely satisfied with your purchase simply return the merchandise to any Lowe’s store in the U.S. within 90 days. Lowes will repair it, replace it, or, based on your method of payment, refund your money. Cash if your purchase was made with cash or debit card. In-store credit if your purchase was made with a check less than 3 day ago. 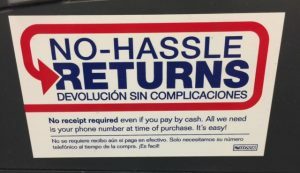 Cash if your purchase was made with a check 3 or more days ago. In-store credit if your purchase was made with an in-store credit or gift card. A credit to your Lowe’s Account Receivable (LAR) if your purchase was charged to your LAR. In most instances, your receipt can be retrieved by using the original credit card, checking account number, or by your phone number. In-store credit may be issued for the item’s current selling price. Lost or stolen gift cards can only be replaced for the remaining balance by presenting the original receipt. 30 Days on Major Appliances (including but not limited to Refrigerators 9 cubic feet or larger, Washing Machines, Dryers and Range Houds) Outdoor Power Equipment (including but not limited to Mowers, Chainsaws, Generators, Pressure Washers, Trimmers and Blowers and Highway Trailers Highway Trailer returns must occur in the original State of purchase.